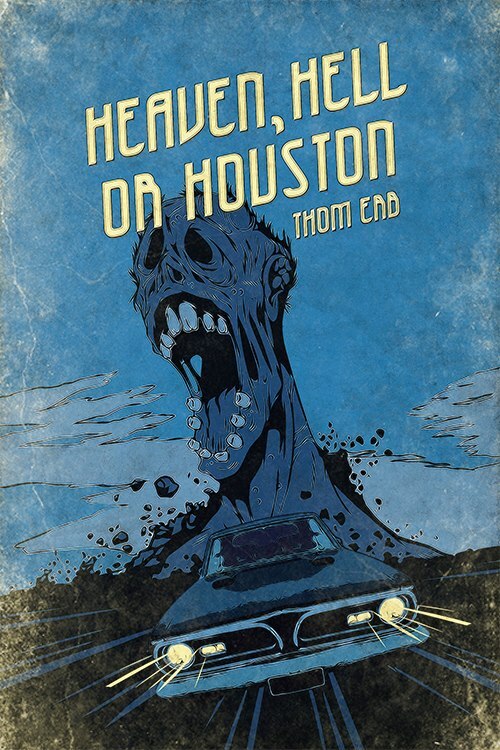 Last week(ish), I was honored to host the very cool Thom Erb and his new novel Heaven, Hell, or Houston. When I finished the book (which I loved), I posted a short review on Amazon and Goodreads. It was my intention to write a more detailed review here, but as I started writing I realized I had just as much to say about my views on zombie fiction as I do about HHH. Heaven, Hell, or Houston is a book about a Texas Ranger, the Mexican crime boss that he locked up, and a growing horde of walking dead. While reading the book, I was amazed that it wasn’t until somewhere around halfway through the book that the dead actually came to life. The story just grabbed me and pulled me in, which is exactly what you hope a book does. The odd part for me was the realization that I should have come to a long time ago: it’s not really about the zombies. Sure, there’s something about the zombies that people dig. I don’t believe there’s a real fear to it, but it could be that zombies somehow represent all that is bad in people while being separated from humanity (you know, because they’re dead). That makes it ok to kill the bad guy, right? Kill without guilt? Maybe it’s the bourbon making that up, but the point is this: zombie/apocalyptic fiction is super popular for a reason, and it’s not just because there’s a bunch of zombies walking around. Now, that’s not to say the addition of zombies to a normal story just makes it a normal story with zombies. Did that even make sense? What I’m trying to say is: sometimes the setting is just as important to the story as the characters themselves. For example, when I think back on Heaven, Hell, or Houston, the scene that sticks out for me is when a character dies and feels himself becoming one of the undead. He knows it’s happening, but there’s nothing he can do to stop it. It’s a damn fine little bit of storytelling that lingers long after the final page. Here’s a comparison for you: science fiction. Aside from spaceships and laser beams and aliens, what’s the difference? Nothing. What about fantasy? Aside from elves and orcs and dragons, what’s the difference? Nothing. More to the point, aside from zombies and survival and the end of the world, what’s the difference? Nothing. It’s just another way to tell a story, hopefully a good one, about people getting into adventures that you want to read. So that brings me back to the original intention: Heaven, Hell, or Houston. It’s a pretty damn awesome story about people. People who have issues. Real issues. It’s about violence and bloodshed, and it’s about people risking their own skin to save each other. It’s about family, friendship, and love. It’s also got zombies. That takes a damn fine story and makes it a little bit different. That’s why I couldn’t wait to get to the end, and that’s why I’ll be keeping my eyes open for a sequel. psst! Hey Thom…no kidding, you should totally write a sequel!